The year may be drawing to a close but that doesn’t mean scammers are taking any time off for the holidays. A new bulletin issued by the Federal Trade Commission highlights a fresh wave of Netflix phishing scams that have been landing in email inboxes around the globe. The scam itself is old. 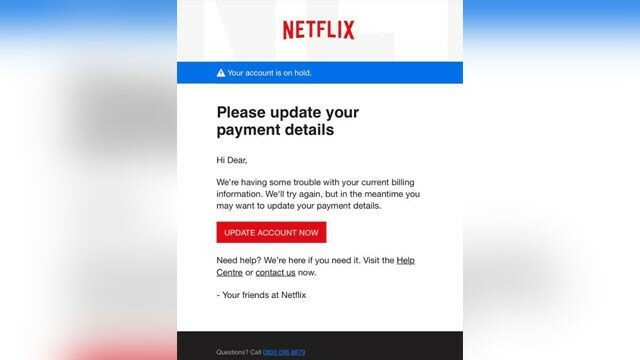 It’s a classic “update your payment information” request that includes a link to a fake Netflix login screen where gullible folks might enter their details, and it’s the kind of thing that we see pretty regularly in our spam filters and junk mail folders, but this particular scam is apparently widespread enough to have drawn the attention of the FTC. The FTC’s warning comes with a screenshot of what the fake Netflix email looks like. As you can see, it’s a pretty standard phishing attempt that includes several links, but they won’t take you to Netflix’s official website. Instead you’ll be funneled to a fake Netflix front page where login details are harvested and sent back to the scammers. The FTC says this email was obtained via law enforcement out of Ohio but, as Engadget points out, the text is British English. Scams like this tend to cast a broad net so it’s entirely possible that someone in Ohio received this email, or that the screenshot was taken from phishing alerts issued by authorities in the U.K. or elsewhere.